Rather than raise my objections at the general level of Johnson’s theory, I will follow Johnson into the realm of musical analysis in order to draw out my critique in a specific context. In Johnson’s most recent book, The Body in the Mind, music is a privileged domain because of way that music offers “exemplary cases of embodied, immanent meaning.”6 “When we turn to music…we will see just how much…embodied meaning is operating below the level of words and propositional content.”7 In particular, my critique focuses on the relation between description and explanation in Johnson’s account of musical meaning-making. Johnson claims that image-schemata are relevant for shaping musical meaning. Generally, schemata are necessary because, “in order for us to have meaningful, connected experiences…there must be a pattern and order to our actions, perceptions and conceptions. A schema is a recurrent pattern, shape, and regularity in, or of, these ongoing ordering activities.”8 More specifically, certain kinds of schemata, which Johnson calls orientational metaphors, are useful for addressing a classic problem of musical perception: why do we refer to pitches as being high and low when frequencies are in reality fast and slow, and (moreover) our means of producing pitches may run completely counter to this conceptualization? According to Johnson, orientational schemata, like the VERTICALITY schema, “arise from the fact that we have bodies of the sort we have and that they function as they do in our physical environment.”9 Thus, despite culturally distinct ways of applying this schema, orientational schemata are non-propositional, embodied, and fundamental in structuring concepts and experiences with respect to one another. According to music theorist Larry Zbikowski, whose work is methodologically indebted to Johnson, the VERTICALITY schema is “invoked by the various conceptual metaphors that use vertical space as a source domain through which to structure target domains…[such as] musical pitch.”10 The VERTICALITY schema is grasped “repeatedly, in thousands of perceptions” and reinforced daily in such experiences as, “perceiving a tree, our felt sense of standing upright, [or] the activity of climbing the stairs.”11 The pervasiveness of these experiences is intended to account for the pervasiveness of VERTICALITY as a structuring schema for pitch perception. 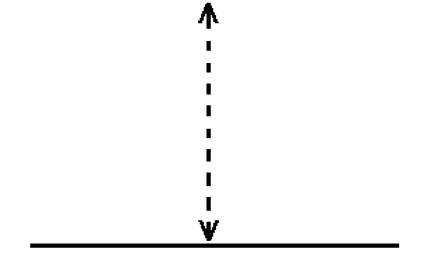 First, one-dimensionality, in that pitches are structured in terms of a one-dimensional Euclidean line. Second, unique correspondence, meaning that each pitch corresponds to a particular point on the line. Figure 2. Arlen and Harburg, “Over the Rainbow,” opening phrase. Johnson adds one other aspect to the VERTICALITY schema: tension. Johnson claims, “The slide from ‘Some’ (E-flat) up to ‘where’ (the octave) creates a tension, the felt tension as we move from the lower pitch to the higher pitch and feel the strain and increased energy required to reach the higher note.”15 The addition of musical tension introduces the kinds of bodily entailments that Johnson wants, for not only do pitches move from low to high, they are felt to do so in a gravitational field where lifting an object requires work and where the potential energy stored in such efforts demands release. Johnson claims that the tension of the melody is not fully resolved until the end of the phrase, when the E-flat returns to its original position. Perhaps one could say that musical tension is being understood as a conceptual metaphor for the buildup and release of potential energy. As an experiment, say I were to alter just one note of the melody, and change the low E-flat with which the melody begins up one semitone, to E-natural. Figure 3. “Over the Rainbow,” with E-natural replacing E-flat. In terms of distance, the opening interval is barely altered—reduced from 12 semitones to 11 (a reduction of roughly 8 percent). But listen to how the whole melody has been altered in terms of tension. Yet, this change in tension cannot be accounted for in terms of the VERTICALITY schema and its association of musical tension with potential energy. Listen to the opening interval in isolation. We still have a leap, yet the leap is now tenser than before, although it requires less work to leap there. Moreover, you may now feel that the leap wants to resolve the tension by moving upwards (like so…). Figure 4. Resolution of modified opening interval. According to Johnson’s entailments, this opening interval should feel less tense because the potential energy has been decreased by one semitone. But that is not the case. Doesn’t the felt tension of the altered interval directly contradict the structuring role of the VERTICALITY schema, by contradicting thousands of everyday experiences of potential energy and gravitational pull? I would argue that melodic tension is not sufficiently explained by conceptual metaphors of verticality and entailments of gravitation alone. Similarly, Johnson’s account of “Over the Rainbow” also founders on the problem of octave equivalence. When I changed the opening note of the melody, I changed the opening interval from a perfect octave to a diminished octave, or (if I had spelled it differently, a major seventh). There is something important in the fact that this alteration now makes the opening interval leap from pitch class E-natural to E-flat, and not remain on the pitch class E-flat. In other words, the original opening leap has both sameness and difference about it–the pitch class (E-flat) remains the same (E-flat) but the register changes; verticality alone does not capture the sense of sameness and difference. Moving upwards along a chromatic scale is not merely an ascent; the chromatic scale, when heard in relation to a tonic, produces the experience of circularity—or so it could be conceptualized. Perhaps we could say that our understanding of pitch chroma (which is technical name for the phenomenon at issue here) is based on a CIRCULARITY schema, where a listener perceives pitches as if they move around a wheel, returning again and again to a their starting point. Music psychologist Roger Shepard offers a more robust spatial model than the VERTICALITY schema alone, one that captures both the phenomenon of the circularity of pitch chroma and the verticality of pitch height by combining both schemata into a simple helix. Figure 6. “Over the Rainbow,” first half of opening phrase. What if I, acting as an arranger, wanted to improve the melody by slackening the tension a bit; according to Johnson’s reasoning, I might think that A-natural would be a better note upon which to repose than B-flat, because it is a semitone lower. Yet upon hearing it, I might be disappointed in the results. Figure 7. “Over the Rainbow,” first half of first phrase, with A-natural replacing B-flat. 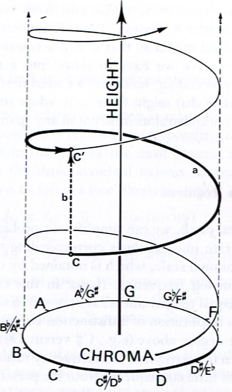 Johnson’s dependence on the VERTICALITY schema cannot explain why B-flat is a better note that A-natural—because the VERTICALITY schema and its gravitational theory of tension cannot account for the role played by fifth-relations in tonal music. In other words, it cannot account for the unusual fact that notes separated by the interval of a perfect fifth are perceived to be more closely bound together than notes separated by other intervals. Fifth-relations can be represented on another circle, like the pitch chroma circle, known commonly as the circle of fifths. This model captures the perceptual proximity of B-flat to E-flat, which is only one hour apart on the clockface, but this new model no longer represents the circularity of pitch chroma. To capture all the features addressed simultaneously (that is verticality, chroma, and fifth-relatedness) requires a much more complicated, but much more robust model. 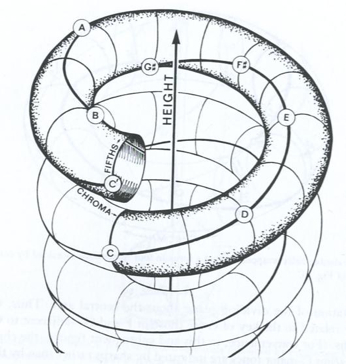 The first helix would get wrapped around the second, resulting in a helix wrapped around a helical cylinder, in five dimensions! Shepard’s final model captures the perceptual saliencies at work in “Over the Rainbow” that Johnson addresses, yet the proponent of image-schemata would hardly feel comfortable arguing that this model is embodied in the way the VERTICALITY schema is embodied. What kind of everyday experiences could ever support this five-dimensional model? However, as a spatial representation, it is far more accurate at modeling the relevant aspects of pitch perception that concern Johnson. I could agree with Johnson, if his claim were simply descriptive in character. That is, I would find nothing objectionable if he were only claiming that we require multiple, often inconsistent structures (or habits, or preferences, or norms) to describe musical works, given the overdetermined multiplicity of aspects inherent in even in the simplest of musical phenomena.17 But Johnson’s claim is not intended to be descriptive; image-schematic theory is intended to explain how such experiences are conceptualized in the first place, i.e. how they are structured. To bring these statement to bear on the musical example above, one might reconstruct Johnson’s claims as follows: when we experience variations in pitch, those variations evoke feeling-thinking responses in us; in particular, those variations evoke patterns of neural activation that are also shared, or related to, or somehow associated with, other patterns of neural activation that are bound to experiences of verticality, such as “perceiving a tree, our felt sense of standing upright, [or] the activity of climbing the stairs.” But if the perception of pitch triggers the brain into habitual patterns that are associated with verticality, how does it pick or choose which parts of those total experiential patterns will be relevant? For instance, why is gravitational pull not consistently relevant to pitch perception, e.g., why can we alter one pitch and now defy all of those overwhelmingly repeated feelings and experiences? What mechanism constrains which features of the neural pattern are to be exploited and which are neglected? What makes one aspect of the source domain salient when transferred (or associated, or compared, or related…) and another one irrelevant? As an explanation, Johnson’s theory is ad hoc. A critical reader is not offered principles for how distinct instances of neural activation patterns are related to one another, nor how such patterns can be responsible for justifying Johnson’s ostensible phenomenological evidence for cross-domain mapping. Rather, Johnson offers a hand waving appeal to neural patterns as some sort of explanatory catch-all. If Johnson constrained image-schemata to operating as descriptions of musical works, I would be less troubled by its ad hoc character. For, I could take that bit of description and compare it to my own understanding of the work. I could treat it as a claim, demanding a certain way of hearing some stretch of sound. And I could also reject this description as inaccurate, or proffer forth my own description. But, qua explanation, Johnson’s theory oversteps its legitimacy by claiming that it is an account of how that phenomenon is structured. For all of Johnson’s monistic revision of the Kantian schematism, in the end we are forced to accept a bit of the old hidden art: a mechanism, concealed in the depths of the human soul, demanded by the exigencies of the theory; a mysterious third term, which mediates the materiality of neural activation and the phenomenality of lived experience; and an explanation that amounts to little more than a solicitation of the reader’s faith. Brian Kane is Assistant Professor of Music at Yale University. He is the author of Sound Unseen: Acousmatic Sound in Theory and Practice (Oxford University Press, 2014). a sort of daily dump of links i have checked.. | imagine art -||+ there about?a sort of daily dump of links i have checked..